Last Friday, The New World, a fictionalized account of the (most likely nonexistent) romance between Captain John Smith of Jamestown and the Indian princess Pocahontas in 1608, rolled out nationwide to 811 movie theatres. It is currently boring senseless any filmgoer naïve enough to believe the rapturous reviews in much of the prestige press. That's particularly unfortunate because a tremendous true story is lost in the tedium. The New World is only the fourth movie in celebrated director Terrence Malick's career, which goes all the way back to the superb Badlands in 1973 and the lovely-looking Days of Heaven in 1978. Unfortunately, it is another snooze in the tradition of his The Thin Red Line in 1998. Still, there's another 45 minutes of repetitious shots of verdant nature in prelapsarian Virginia that could have been left on the cutting room floor. It's been said that fish gotta swim and birds gotta fly. But where is it written that auteurs gotta show every damn fish swimming and bird flying in Virginia? Even at 135 minutes, this is still very much the Director's Cut. We're unlikely to ever see the 90-minute Editor's Cut that would make The New World tolerable. And even then it still wouldn't be terribly good. As Smith, Irish pretty boy Colin Farrell, last seen stinking up the screen in Oliver Stone's Alexander, once against plays a military legend as a self-pitying mope. It doesn't help that Malick gives him little to do other than moon like a lovesick adolescent over Pocahontas. 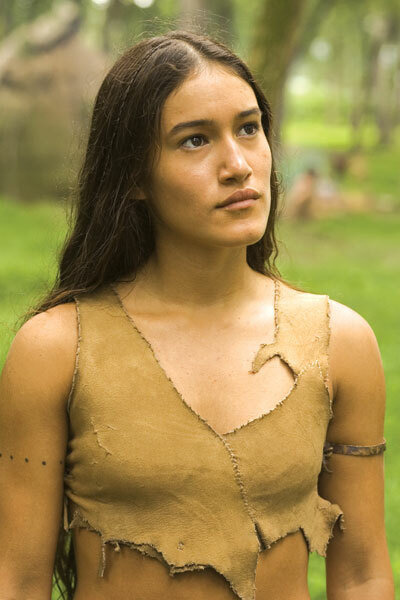 As the Algonquin maiden, 14-year-old Q'Orianka Kilcher is better than Farrell (although her buckskin minidress bears a distracting resemblance to Betty Rubble's). It's striking, though, that in a movie celebrating the superiority of American Indians, Malick couldn't find a full-blooded Native American to cast as his heroine. Kilcher's Swiss mother is the cousin of blonde babe singer Jewel. Eventually, Christian Bale shows up as the reserved widower John Rolfe (who launched the tobacco business in Virginia). After Pocahontas had become the first American Indian to convert to Christianity, Rolfe married her in 1614. This brought about a much-needed six years of peace between the Algonquin Indians and the English. Rolfe took Princess Pocahontas to England in 1616. Malick depicts England as an oppressive place—although in fact it was liberating enough to have fostered William Shakespeare, who died that year. Pocahontas charmed the royal family and high society. But she died suddenly in 1617 as the family was headed back to America. Their son, Thomas Rolfe, moved to Virginia when he became an adult. Today, most of the venerable families in the Old Dominion claim Pocahontas as an ancestor. By one estimate, Pocahontas has about 100,000 living American descendants today. The New World would have been better if Farrell had switched roles with the more formidable Bale, who in last summer's Batman Begins made a respectable superhero. After all, Captain Smith was almost a superhero himself. You have to be as self-infatuated as Malick is to make a bore out of Smith, who led a life filled with extraordinary exploits. With Bale in the lead and a first-rate action director, such as Braveheart's Mel Gibson (who provided the voice for Smith in Disney's drippy New Age Pocahontas cartoon musical in 1994), Smith's story would have made a terrific movie. Born in 1580, Smith left England at age 16 to be a soldier of fortune on the European continent. First, he fought the Spanish to help free the Netherlands. Then, according to his memoirs, he survived numerous spectacular adventures fighting alongside Hungarians against the Turks, including being captured and sold into slavery in the Ottoman Empire and escaping via Russia. He was only 27 when he landed in Virginia. But he'd already had a lifetime of military experience. Settling in America was a fraught enterprise, as demonstrated by the still-mysterious extinction of Sir Walter Raleigh's Lost Colony of Roanoke Island—shortly after the birth of VDARE.COM's eponymous Virginia Dare in 1587. After his return from captivity under King Powhatan, Smith took control of the floundering settlement of Jamestown in 1608. He proclaimed to the many lay-about gentlemen, "those who will not work will not eat," thus enabling Jamestown to survive the harsh winter. As participants in a commercial enterprise, the Jamestown settlers were not as well endowed with the heroic self-discipline displayed by the religiously-motivated Pilgrims in 1620. Smith's leadership and hardheaded common sense were vital. As were visits from Pocahontas that winter bringing food. After Smith had to return to England in 1609 following a near-fatal gunpowder accident, much of the colony starved to death without his guidance. In London, Smith published two books advocating that settlers and their financial backers give up their get-rich-quick schemes for finding gold, and instead get rich slowly by farming, fishing, and trading with the Indians. He later explored much of the coastline of New England and, indeed, gave it its name in his famous 1614 map. In 1615, Smith launched a well-planned attempt to settle New England, several years before the Mayflower, which would have made him by far the most important figure in the populating of English America. Unfortunately, his two ships were damaged in a terrible storm and barely limped back to England. On Smith's next attempt to reach New England, his ship was seized by pirates. The buccaneer captain turned out to be an old friend from his mercenary days, and Smith talked him into accompanying them to New England. Then, both ships were captured by French pirates, from whom Smith eventually made a daring escape. After one more failure in 1617, he couldn't raise more funding and retired to writing books. Beginning during the sectional tension of the 1850s, Northern writers, such as Henry Adams, denigrated this Southern hero's credibility. In 1890, their skepticism seemed to be verified when a Hungarian historian announced that he couldn't find mention of any of the Hungarian people or places in Smith's account, and declared Smith "an impudent forger." "The truth was that Smith, like so many Englishmen before and since, had a genius, if not a passion, for misspelling foreign names." This doesn't prove that Princess Pocahontas saved Smith from being executed by King Powhatan's braves. But it could well have happened. Less likely is Malick's contention that Smith immediately fell in love with Pocahontas, who was probably only 10 to 13 years old. Smith never claimed that, even though he wrote that his escape from Turkish slavery was due to his female owner falling in love with him. His feelings for Pocahontas seem to have been avuncular rather than romantic. Smith's life would make a dazzling epic adventure film. But what are the odds of that ever getting made in today's Hollywood—where few topics are more unfashionable than the British settlement of America?